Let us introduce you Age of the Gods Twister ! The combination between the dynamics of the Twister gameplay and the unique possibility to win one of the four Age of the Gods mystery jackpots ! The Age of the Gods Jackpot games and wins are unique for every player and do not depend on the outcome of the Twister tournament. 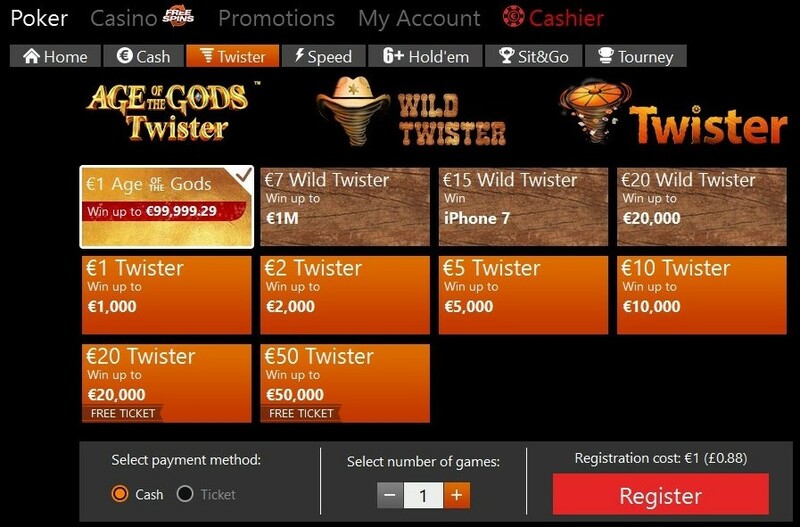 When registering to an Age of the Gods Twister tournament, a small amount of your bet goes into the Age of the Gods Jackpot, giving you the chance to win one of the four jackpots. Upon the start of the tournament, a slot animation will determine the Twister prize pool. If one or more players in the Age of the Gods Twister tournament is chosen to play for the Age of the Gods Jackpot game, the Twister tournament will be paused until the Age of the Gods jackpot game is finished or the 30 seconds timer runs out (in which case the game will auto play and the prize will be awarded to the player). All the players on the table will be notified of the jackpot win. After that, the Twister tournament will continue using the standard Twister tournament rules. Jackpot game is triggered randomly on the Age of the Gods Twister tournament start. Entering the Jacpot game guarantees a win. Match 3 jackpot symbols of the corresponding Jackpot or wait for the 30 second timer to run out.